The annual event is here again. Time to try our luck and ballot for tickets to our Nation's birthday celebration. Ticket application starts from 17th May to 25th May 2014. 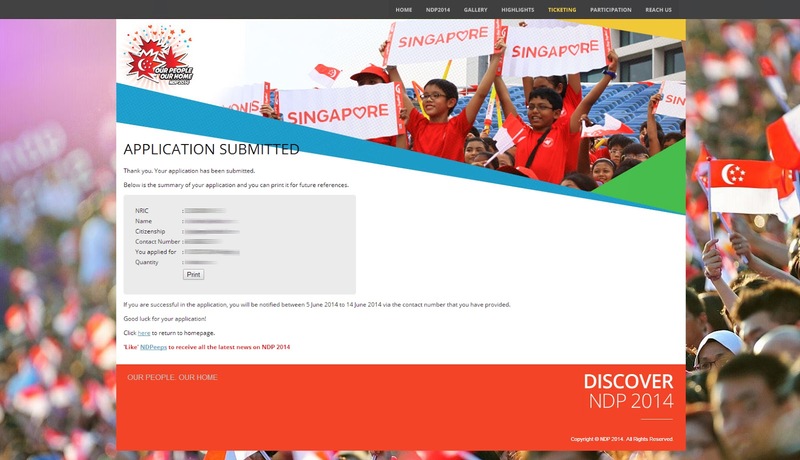 Singapore Citizens and Singapore Permanent Residents are eligible to apply for tickets for the Actual NDP on 9th August 2014 and the NDP Preview on 2nd August 2014. 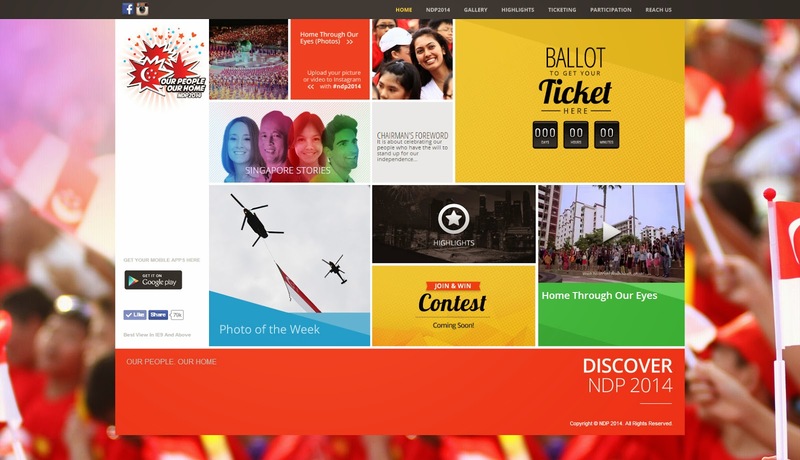 All successful applicants in the NDP 2013 ticket e-balloting exercise will not be eligible for the NDP 2014 ticketing e-balloting exercise. Each applicant can only apply for 2, 4 or 6 tickets. Successful applicants will be notified via SMS from 5th to 14th June 2014 through their preferred contact numbers provided during their applications and are to reply via SMS to indicate the acceptance or rejection of the tickets. I had submitted my chance. Have you? Go try your luck this year. 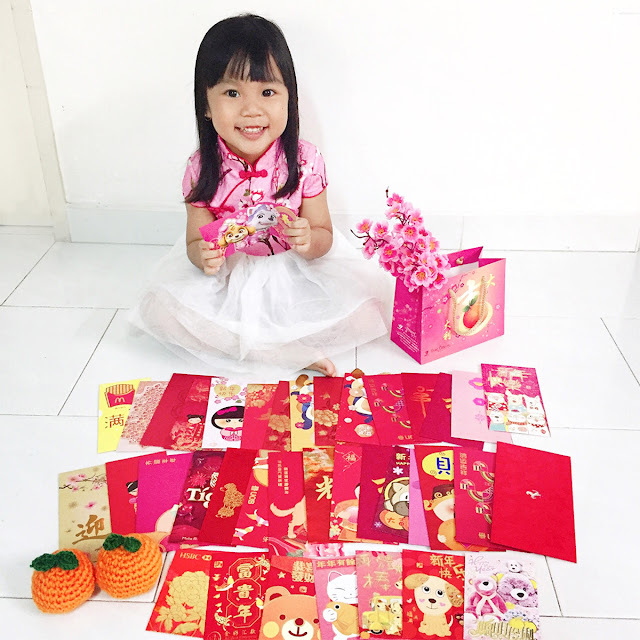 [Update 21 May 2014] Yesterday, a blogger shared about a security loophole in the balloting system (read here), that may cause leakage of our submitted personal information. 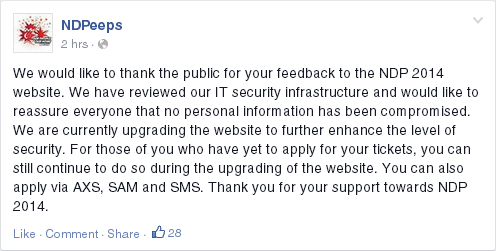 (I am praying hard that no one has attempted to hack for information) Today, NDP Facebook has released a statement that they will be enhancing on the website's security and assured that no confidential information has been compromised. I think the safest way to ballot, for now, is via AXS, SAM and SMS.